Broadband prices have dropped by more than 50% since 2005, giving way to faster, cheaper internet for millions of people.But what exactly brought on the broadband boom? An agreement between telecoms regulator Ofcom and BT Openreach allowed rival providers to install their own equipment in telephone exchanges, completely transforming the market. This process is known as Local Loop Unbundling (LLU). 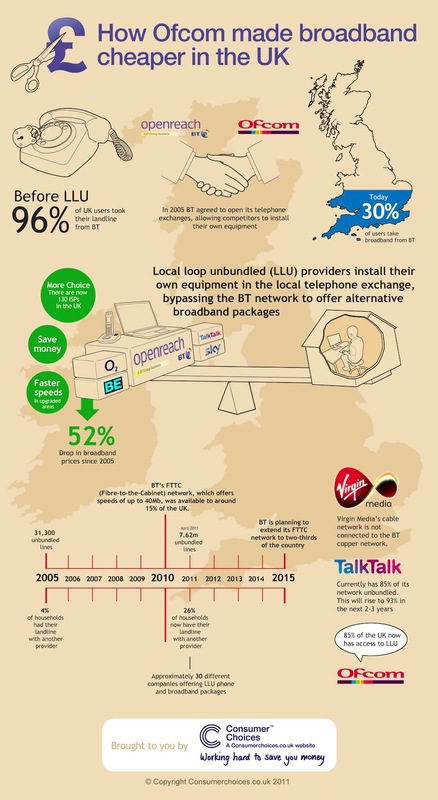 Infographic by BroadbandChoices.co.uk, the UK’s leading broadband comparison service which helps consumers compare broadband phone and TV packages. With the rising cost of fuel, utility bills, car insurance and even food, the lower cost of broadband across some regions of the UK for me has been a god send. Previous post: Photo eBook: “A Deeper Frame” by David duChemin PLUS the Deepest Discount Ever!